Made in complete proportion to the real Maple Leaf Canadian flag. All the coloured sections are made from slabs - scraps pieced together to make fabric. The technique is in our book, Sunday Morning Quilts. I wanted to show that the slabs can be used for more than straight blocks. I also wanted to share a little patriotism to show the Brits that the Union Jack isn't the only flag worth making into a quilt. How awesomely Canadian of me to snap the photos on Lake Louise as we skated on a snowy days. Hockey skates, fires, mountain, snow... Damn, I love where I live! Seriously, I do love where I live. Even when I have to pay my taxes and deal with dumb politicians (but those are everywhere, right?). I love our spaces, our vistas, our social leanings, our multi-culturalism, our healthcare (even when flawed), our cities, our variety in everything. I even love my accent. And that's PROgress if you know me. For the quilting on this I used a combination of Aurifil 50w in white - to densely quilt the white sections with a lot of texture - and Presencia in coordinating colours for each flag section. There were a lot of threads to bury at the end, but it was so worth it. I will be developing this into a pattern, I promise. Hopefully before Canada Day. I'll keep you posted. I so love this quilt! And I like where you live too...so pretty. And after many years of attending the Farm PROgress show in Regina, I even get that comment! It's beautiful! I just love it. I too love where I live, well except for maybe yesterday after coming home Sat. from Argentina with 25-30*C temps. to a blizzard. the quilt looks lovely at Lake Louise. You can't get more Cdn than that eh! It's beautiful! I love the colours. Especially with the skates. Fabulous quilt Cheryl! I sure love where I live too - we've got the same backyard and its one of the loveliest in the world! There is nothing I don't love about this post. Love love love this and I'm not even Canadian! 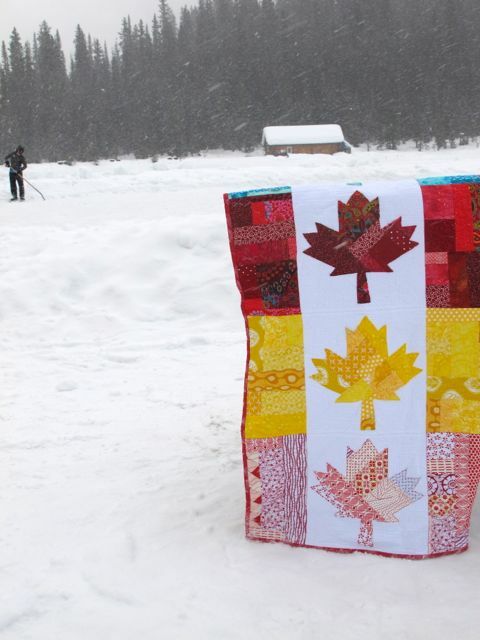 What a great juxtaposition of the snow and mountains with the bright colors of this quilt. LOVE IT! Looking forward to your pattern! I'm a Canadian (Ontario), now American gal living in California the past 24 years and loving it. Lake Louise is one of the most beautiful places on the planet. Great choice for spot to photograph this beautiful quilt. I can see one of these photos ending up in Canadian Living magazine, can't you? So glad to see this beauty. Love, love, love it! This is such a beautiful quilt, totally amazing, I love the detail. And it looks stunning with the scenery. Love it! And yes, you are so right, taxes and idiotic politicians are everywhere...check out the U.S.! LOL! Best to you, always, Cheryl. 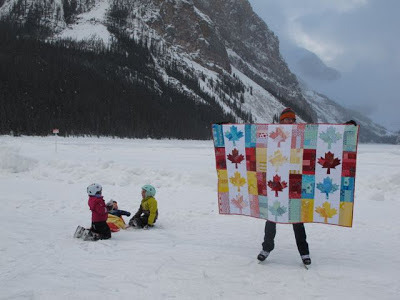 Hi love the quilt and lake Louise looks amazing - as a Brit I can say your flag Quilt is amazing ! :) ps love the Sunday morning quilt book and your blog ! To paraphrase a couple of Canadian Icons (Bob and Doug MacKenzie)"It's like totally righteous duude". I absotively posilutely love this quilt. It is a MUST for me to complete for my Canada Day baby (OK so she's 24 this yr) as I get her some kinda Canadiana every year. Once again you have outdone yourself Cheryl. YOu have red and white flowing through your viens--oh, we all do; red and white blood cells. You know what I mean !? This may have to be my new screensaver I can't stop looking at it. I had to show this to my Canadian husband. Beautifully done! So nice to see this finished beauty, Cheryl! Great opportunity to show off our beautiful country too! Looking forward to the pattern. Love the quilt and your book. Great scenery wished I lived closer to the mountains. Brava! It's wonderful, Cheryl. A beautiful ode to our fabulous country. Fantabulous quilt! 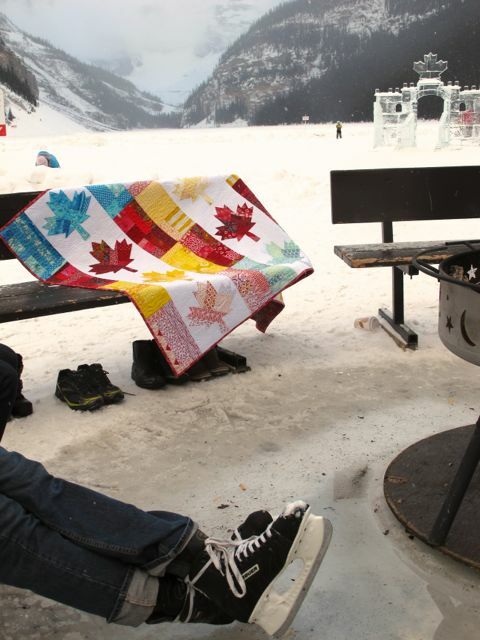 Being Canadian in the Canadian Rocky Mountains @ Lake Louise in winter is the best! Totally awesome dude! I love the picture with the skates! Wonderful quilt and great pictures. 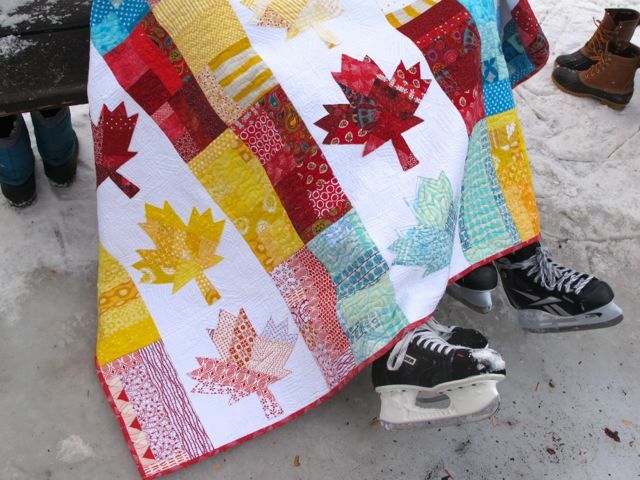 I love the one where the quilt is being held up with ice skates underneath! I love this! I feel an affinity for Canada, despite being Australian. My brother lived in Whistler for 18 months in 2011-12 and Banff for 6 months in 2008-9. My cousin also married a Canadian girl in July last year. When they have a baby I plan to make a maple leaf baby quilt for them. Apparently australia and Canada are quite similar in their space, their social values and multiculturalism. It's on the travel list! YAY O'Canada! 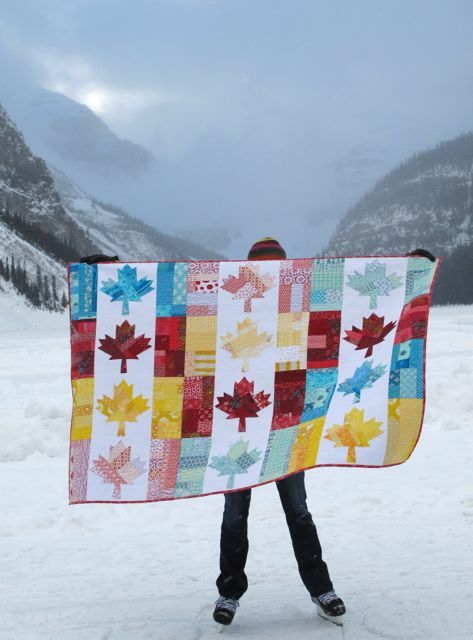 So cool to see a Canadian Maple Leaf quilt, we don't tend to toot our own horn, this is fun! I love how the leaves themselves are all patchwork-y inside. xo! Oh my Gosh! I love, love , love it! I love Canada, it is the best place to be born and raised! My son is a Captain in the Canadian Army and would love to make this for him and his family. How did you get such accurate maple leaves??? Great job and beautiful pictures! I'm not Canadian but I love it there and love leaves too! Did anyone else see the maple leaf atop the ice sculpture in one of the photos? Did you plant that there on purpose? Totally awesome. It's so wonderful! Have you ever read the Sweater? It's beautiful. Looking forward to the pattern. looks FANTASTIC! love the scenery too! What a beautiful quilt, Cheryl! It is very interesting to see the "slabs" made up into a different pattern. I made a laptop cover recently with the Canadian flag on one side & the Swiss flag on the other to celebrate a dual citizenship. Very cool quilt! Wonderful post and quilt! I'm looking forward to your class here in Thunder Bay next month! Awesome quilt, eh? I love how you took the quilt to the perfect location for your photoshoot. This is the first time I can remember seeing skates in a quilt photoshoot! What an awesome quilt. I saw this on pinterest and had to come over for a better look. I'm Canadian as well so I totally get this! This is SO GREAT! Haven't you got the pattern ready yet???!!! This is just beautiful.....I love where you live also!!! I don't care what anyone says, I can't go without snow! I live in Michigan and proud of it!! Patiently waiting for the pattern. I totally LOVE this quilt and NEED to make one! Is your pattern available??? I will purchase it right now if it is!!! I too would buy this pattern asap. 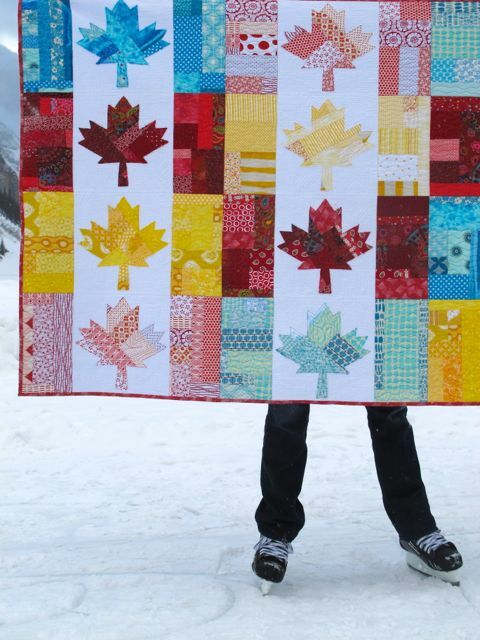 I'd love to make one for Canada Day this year. Let me know when it's availabale. Wow - I have just seen your wonderful Maple leaf quilt and I read that you planned on making a pattern of it - I hope that you have managed to do that because I would love to make one - your maple leaf is the best one I have ever seen. Please let me know whether you have a pattern or not. Thanks so much.